I’m willing to bet that there’s only a small amount of neighborhoods and towns in this country that haven’t seen new construction happen in nearly 50 years. This is a significant amount of time to not have any new development. Unfortunately it has become a norm in many neighborhoods of Detroit that forces long time residents to say “it never used to be like this”. I am fortunate to be doing work in one of these areas to change this though. As a result, it has become a neighborhood that I get attached to more and every day, and almost feel like a long time resident. I’m talking about Dubois Street between Hancock and Warren on the East Side. On this block, there are only 4 structures remaining on the 24 available lots. 1 is an occupied house, 1 is vacant and blighted, 1 is just a burnt shell, and 1 is being redeveloped. 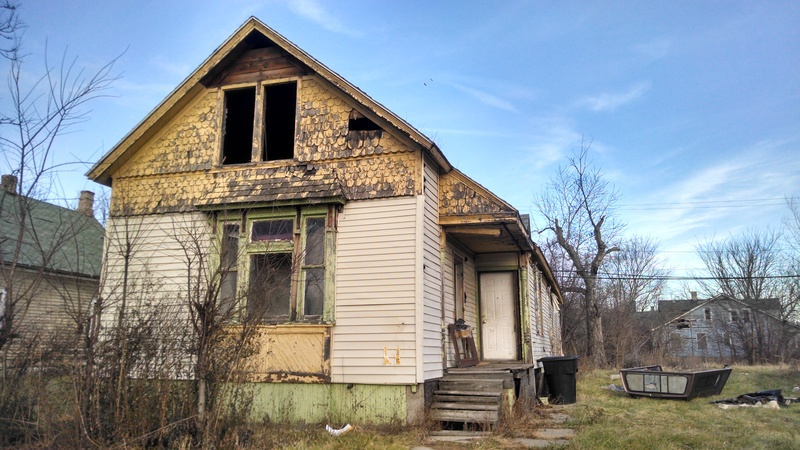 The redeveloped one is mine, I bought it for $1,000 from the Detroit Land Bank back in February 2015 in order to see through a grant project at Lawrence Tech in my final year that aimed to promote responsible, sustainable removal of blight through deconstruction rather than demolition. This quick, short term purchase has transformed into a long term investment and is slowly changing my life. In February, at 23 I ended up becoming a landowner twice over. I purchased the Dubois property in cash, and mortgaged a house in Ferndale. Directly after those purchases I quit my well paying engineering job because it wasn’t what I wanted and made the decision not to work until the end of August. I was set to graduate in May with my Masters and desperately needed a summer off after 6 long years of school. I was questioned heavily as to how I was going to afford all of this. My response? Time was more valuable than money right now. So this past summer, I moved to Ferndale, had no job or classes for the first time ever, took a few vacations, and focused on myself. It was the best summer I’ve ever had. I may never get a chance to do that again. Fortunately, in March, I applied for Challenge Detroit, made it to the interviews in May, and was accepted into the program early June with an expected start date for September. This solidified my goal of taking the summer off knowing I had an fantastic opportunity waiting in the Fall. Last month Challenge Detroit started. I moved once again but this time to Downtown Detroit where I’ll be living and working at my host company Rossetti Architects at least for the next year. My point to all this? Sometimes you need to help and understand yourself before you can help others. I can comfortably say that I am now poised than ever to do this in Detroit over the next year, a city I call home in many respects. But back to Dubois. I did all that in preparation for impacting this area as much as it’s impacted me. Because aside from living downtown, Dubois is also my home. 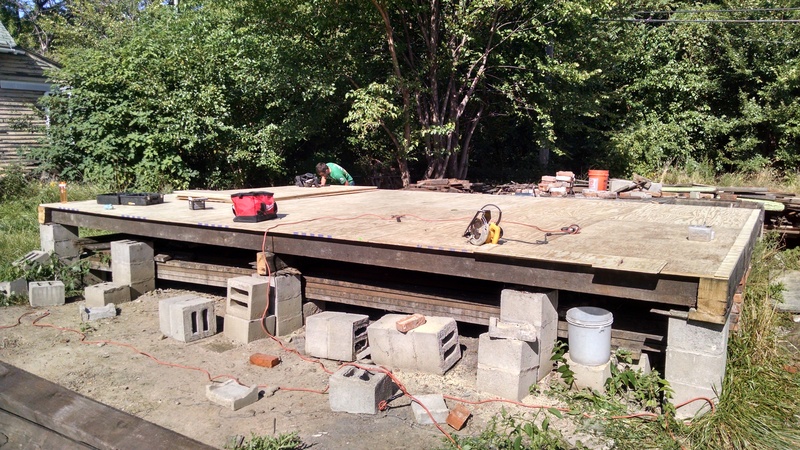 3 weeks ago we started new construction of a storage barn on top of the existing 127 year old foundation. Despite receiving positive feedback on deconstruction back in March, I wasn’t sure how new construction would be received. After all, this area was used to seeing houses come down, or burnt down, but not built up. That’s how I know that Dubois is becoming home. There’s a lot of misconceptions about being someone from the outside coming into a Detroit neighborhood to “make it better”. I’ll be the first to admit that I was nervous about doing work in the area in the beginning. But I’ve found that if you approach it the right way, are inclusive and transparent, and physically act rather than talk about acting, you become received as just another person fighting for this city. And what’s more important than that right now in Detroit? 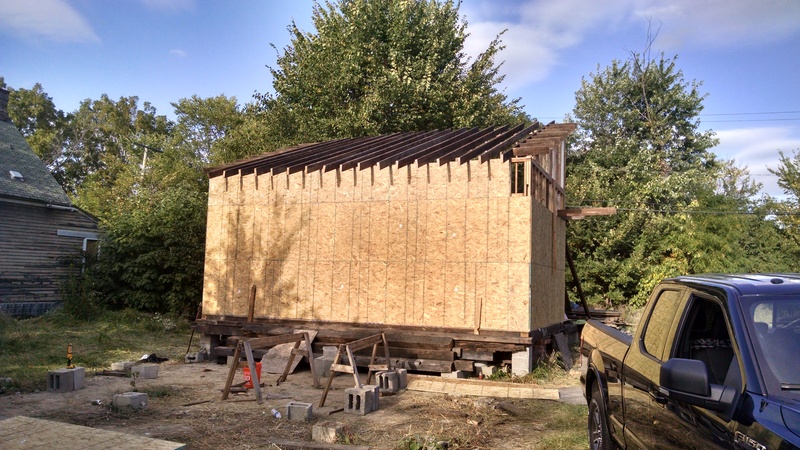 Once the barn is done we plan to take care of the vacant side lots. We then eventually hope to do some work on the blighted houses on either side of us. In the spring there will be a garden there, and I hope that this development on Dubois can become a nucleus for something much bigger for the neighborhood. We’re only in the beginning, but so was Frank Funk when he built the house in 1888. 127 years later his house is one of the few still standing, and it is still changing lives. Maybe not by living there, but in so many other respects. And if I could talk Frank today, I’d just want to say thanks Frank for changing my life.